Donald Trump Jr. gives a television interview at the 2016 Republican National Convention in Cleveland, Ohio U.S. July 19, 2016. Speaking to reporters in the White House briefing room, principal deputy White House press secretary Sarah Sanders said she would refer any questions to lawyers for the president and Trump Jr.
Later in the briefing, which was held off camera, Sanders said Trump was frustrated that Russia “continues to be an issue” and is eager to focus on other things, including tax reform and infrastructure. She declined to answer a question about whether the president is now aware of Russia’s efforts to help his campaign. Congress and a special counsel are investigating Russian interference with the presidential election and alleged collusion with the Trump campaign — a charge the president has repeatedly denied. House Minority Leader Nancy Pelosi, D-California, said that everyone involved in the meeting should be “immediately summoned” to testify under oath between the House and Senate committees investigating Russian meddling. Appearing on CNN, Brian Fallon, the former press secretary for Clinton’s campaign, stressed that the meeting Trump Jr. coordinated also included Paul Manafort, then the campaign’s chairman, and Jared Kushner, the president’s son-in-law. “I think it’s impossible to believe that the president himself was unaware of this apparent effort by the Russian government that was known to others in the Trump campaign,” Fallon said. Most Republicans on Capitol Hill either declined to comment or were dismissive of Trump Jr.’s email exchange. Sen. Lindsey Graham, R-South Carolina, was an exception. “Anytime you’re in a campaign and you get an offer from a foreign government to help your campaign, the answer is ‘no,’” Graham told a group of reporters, adding that Trump Jr. “definitely” must testify as part of investigations into Russia’s election meddling. Marc Lotter, a spokesman for Vice President Mike Pence, said Tuesday that Pence was not aware of the meeting, which took place before he joined the campaign. Trump Jr.’s willingness to accept incriminating information about Clinton could put him or others in legal jeopardy, analysts said, though investigators would likely have to do more work to substantiate any criminal charges. Among those are campaign finance laws. In the United States, it is illegal for foreign nationals to donate things of value in connection with an election, and it is similarly illegal for people to solicit or accept a contribution or donation from a foreigner. The emails show that Trump Jr. arranged to meet with the lawyer, Natalia Veselnitskaya, along with two of the campaign’s most important advisers. Trump Jr. appeared to have forwarded the entire exchange to Manafort as well as Kushner, who is now a top adviser in the West Wing. The New York Times reported that Trump Jr.’s tweets Tuesday came after the newspaper informed Trump Jr. that it had reviewed the emails and intended to publish their content. A Kremlin spokesman has denied knowing who Veselnitskaya is. In an interview with The Washington Post on Tuesday, she said she was not working on behalf of the Russian government but was interested in talking to Trump Jr. about Russian adoptions. “We sat and talked to each other for a few minutes and it was clear we were talking about two different things,” she said. 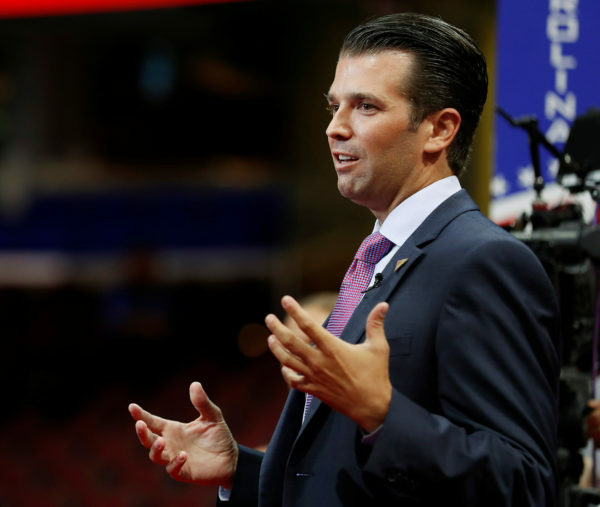 While Trump Jr. said the meeting took place before scrutiny on the Russia issue, in fact his father’s warm comments toward Putin had started a year earlier and had grabbed significant attention among his opponents and foreign policy experts. As early as July 2015, Trump had spoken during a campaign town hall in Las Vegas about his confidence that he could improve U.S.-Russia relations. “I know Putin, and I’ll tell you what, we get along with Putin,” he said. Five days after the June meeting in Trump Tower with the Russian lawyer, The Washington Post reported that hackers believed to be associated with the Russians had penetrated the computer systems of the Democratic National Committee and stolen internal records a few months earlier. WikiLeaks dumped a much larger cache of internal DNC emails on July 22, as the Democratic National Convention opened, causing internal party dissension that led the party chair to resign. Trump’s reaction was to ask Russia at a public news conference if it could locate the 30,000 emails Hillary Clinton had deleted and failed to turn over the State Department from her time as secretary of state, deeming them purely personal. In a July interview on CNN — the month after the meeting with Veselnitskaya — Trump Jr. vociferously dismissed as “disgusting” and “phony” a suggestion that the Russians were attempting to aid his father’s presidential campaign. On Saturday, when the meeting was first reported by the Times, Trump Jr. said that the meeting was about an adoption program that the Kremlin had cut off in retaliation for a U.S. law that targeted Russian human rights abusers. But in a statement Sunday, Trump Jr. said an acquaintance asked him to meet with someone who “might have information helpful to the campaign.” Trump Jr. said the meeting was set up by an acquaintance and that he was not told the name of the person he was meeting. Goldstone on Tuesday confirmed he has hired an attorney, Bob Gage, to handle Russia-related inquiries. A spokeswoman for the Agalarovs said they too have hired American legal counsel to handle the inquiries, engaging Scott Balber in New York.